Cozy Up With Kathy: 恭喜发财 (gōng xǐ fā cái) - Wishing You Wealth and Prosperity! 恭喜发财 (gōng xǐ fā cái) - Wishing You Wealth and Prosperity! Happy New Year! Today is the start of a new year, the lunar new year. 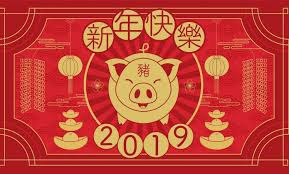 This year is the year of the Pig, or Boar, and this year it falls under the element of Earth. To celebrate I thought I'd focus on some books with Chinese and other Asian ties since the lunar new year is commonly referred to as the Chinese New Year and is celebrated in most Asian cultures. One of my favorite new series may take place in Cleveland, Ohio, but the primary setting is a Chinese restaurant. The Noodle House Mystery series by Vivien Chien starts with Death by Dumpling followed by Dim Sum of All Fears. The third book, Murder Lo Mein will be released March 26, 2019. I can't wait! I'll be dreaming of noodles in various forms until then! The Oxford Tearoom Mystery series may not seem as if it fits in a post celebrating the Chinese New Year. Nor does the Bewitched by Chocolate Mystery series. Indeed, they both are set in the bucolic Cotswolds in England. The author, H. Y. Hanna, studied at Oxford and currently lives in Australia. Hsin-Yi also happens to be Asian. A Scone to Die For and Dark, Witch, and Creamy are the first in the series, respectively. All-Butter ShortDead is a prequel to the Oxford Tearoom Mystery series. Ovidia Yu writes the Aunty Lee Singaporean Mystery series and the Crown Colony Crime series, both of which are set in Singapore. The Aunty Lee series is a delightful culinary themed series while the Crown Colony is a historical series set in the 1930s. Aunty Lee's Delights and The Frangipani Tree Mystery are the first in the series, respectively. In conclusion, I'd like to mention another book. While not a mystery, it does revolve around something a majority of mystery readers and writers enjoy-tea! The Book of Tea by Okakura Kakuzo. is delightful little book published in 1906 which talks about the history and philosophy of the beverage developing into Teaism.